A two-in-one harness for walking and traveling safety. A comfortable fitting harness that is easy on the dog and on the owner. 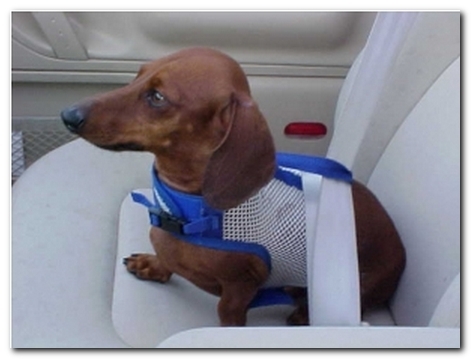 This version of the Hug-A-Dog Harness® doubles as a seatbelt. 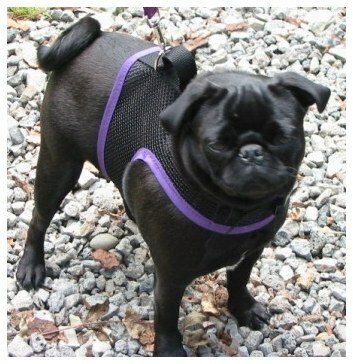 Made of cool, comfortable poly-knit mesh, this harness is easy on the dog and the owner. Easy to put on with hook & loop closures (like Velcro®). No straps. No rubbing or choking. Transfers pulling pressure to chest area. Washable and dryable. The "handle" is also convenient to help steady handicapped pets or to hold a wiggly pooch (as shown by Greta at left). 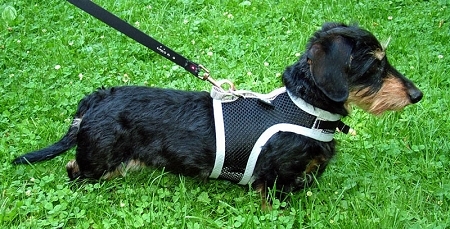 The Hug-A-Dog Harness® is not just for dachshunds -- we can fit ANY BREED! CLICK HERE to see a gallery of photos from happy customers! 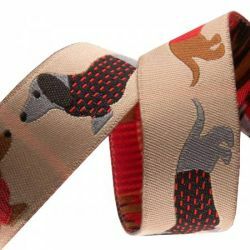 NEW OPTION: A doxie-print woven ribbon can be added to the spine of the harness to add a bit of doxie pizzazz. The design is woven into the ribbon so it is machine washable. Available in tan or blue. PLEASE MEASURE CAREFULLY. THERE IS A $5 EXCHANGE FEE FOR REPLACING A HARNESS RETURNED DUE TO INCORRECT MEASUREMENTS. IF THE HARNESS IS EMBROIDERED, THE RETURN FEE IS $7. 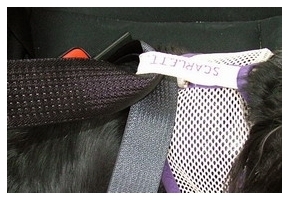 All Hold-A-Dog Seatbelt Harnesses are custom-made. 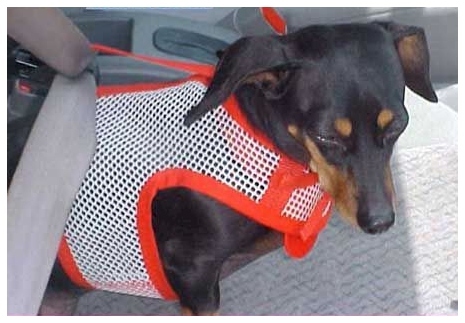 Because of the popularity of these harnesses, please allow 2-3 weeks for delivery. As always, quality item. Fits perfectly. I did send an old harness back to you on July 1, 2015. I have checked, and you received this harness mid July. Would like my account to be credited as promised. Thanks. We have been getting Hug-A-Dog Harnesses for about 5 years now. There aren't any others that are better. We have recommended them to many of our dog loving friends. Fit is always perfect and is comfortable on the dog. We love the wide variety of fabric patterns and colors. The mesh is so perfect for the summer, as it keep the dog so much cooler without compromising on the secureness of the harness. Washes up great. Will use nothing else!!! I ordered my latest rescue a mesh harness. I already had a cloth one for him, but decided he needed an new one for summer. Since he's black and tan and I love lime green, I got him a black mesh with lime green trim. He's looks adorable in it and I feel so good about using Hug-A-Dogs. I've been using them for 20 years now and have never had a dog escape from one. They are the best and so well made they last forever. I still have the original harnesses and they are still usable. Great product. 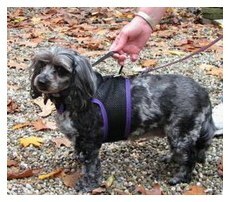 We have an older pet and this harness is easy to get on and off and does not pull on our dog's neck. I called Paws and Pals of southern California, a moxie rescue where I got my pair of dogs for a recommendation because I could not find a harness that fit my dog. One of my dogs slipped a disk in his neck and the vet recommended that he walk with a harness not a collar once better.They said your harness is the only one they use because it always fits well. I ordered one for the injured dog and liked it so much I order another for my second dog. Thanks so much! So glad I found this wonderful product! Not only is it well made but offers safety to my Mini-doxie Penny when she travels with us in the car. She used to only want to sit in my lap in the car and I knew this wasn't safe...to say the least! So I now put one of her beds on the front seat and attach her with the seat belt through the harness and she's very content...as am I knowing she won't fall or get thrown off the seat if I stop quickly! I also use this just for walks as well and the mesh fabric is nice and cool on her body for warmer weather. I have another Hold-A-Dog Harness for winter with warmer fabric that I purchased at a Doxie Fair a few years ago and was so glad to find it in the lighter material. Well worth the price in every way! Thought this may have been a little expensive as I'm in Australia, but I am very pleased with our mesh hug a harness. We love these dog harnesses and so does our little Wendi. She loves to chase squirrels - hates cats, both making it hard to hold her back but this harness is perfect - no choking or causing neck and throat damage. Yes they are a bit pricy but well worth it. We have our second dachshund and our second time using the Hold-a-Dog Harness. The harness is a must for all doxies. It's cute, washable and, with the loop, it keeps him on the car seat. Just don't pick up the dog with the loop - always pick up doxies by the chest and hips. IF you pick up by the loop, it could irritate the area behind his front legs. This is not the fault of the harness at all - it's the fault of us not picking him up properly. Love this harness and highly recommend. I ordered one for my larger Winnie who is a 30lb. Dachshund mix, it has been great. We had a couple of harnesses before this one that she could get out of and then she was difficult to get back, she is very independent and likes to explore the woods off leash. Same problem with little 18 lb. Winnie. He could get out of the old harness so we got another one of these for him and no more problem. They are worth the money as they are very well made and almost impossible for the dogs to get out of them. They are soft and comfortable and hug their bodies. My winnies love to wear them. Thank you so much for offering the perfect solution for our dogs. We are on our 3rd set! there is nothing better than having a 'handle' on a doxie. Its easy to quickly pick them up. (or to buckle them in, as intended) Both of my doxies wear these all the time, and seem to be really comfortable in them. I stopped shopping around for other harnesses, these are worth the money. The vests are up to to your usual high standards. Thank you. Recently ordered a Hold-A-Harness for our new dachshund rescue, Ellie. As in the past, this item is excellent No choking or having a collar slip over the dog's head. I love that the extra loop on top is great for securing Ellie in the car for safety, but also helps at times when holding her from other dogs on our walks and can assist in picking her up. Hold-A-Harness is well-made - fits Ellie to a tee, sturdy and long-lasting. Well worth the cost. I can recommend this item with no reservation. I have used them for two other Dachshunds in the past. We are repeat customers. We have both Hug-a-dog harnesses for walks, and Hold-a-dog harnesses for car journeys The quality and finish is awesome and love the fact that you supply 3 measurements - so they really fit well. Thanks for your great products and quick service turnaround! I absolutely love this hug-a-dog harness. My dog used to pull a bit when walking and I worried about hurting him with just the regular harness...plus he had a lump near where his other harness hit and I worried that the strap irritated him. The hug-a-dog harness fits PERFECTLY and everyone we meet comments on how adorable it looks on him. It's super easy to put on and he sits so nicely for it and it even keeps control when he's trying to "meet" dogs across the street from us when walking. I know it's safe for him and I love the extra features available like the reflective tape and his name on it. He acts like he's a little celebrity in his personalized harness. Do not hesitate to order one for your dog! 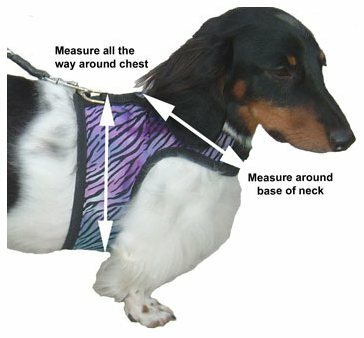 These are the BEST harnesses for the unique dachshund body! Each one is custom made so they fit perfectly. Excellent quality and value! The only harness that I'll use on my long dogs! Have used these harnesses for my doxies for many years and wouldn't use anything else. They fit securely and look great. Have also ordered as gifts for friends who have different breeds of dogs and the fit is always perfect. Thank you! I have two rescue dachshunds and when I got them they had these amazing harnesses with little handles to pick them up or strap them in the car. I have recently ordered brand new ones for my two and I love them. It is impossible for them to slip out and they seem very comfortable in them. 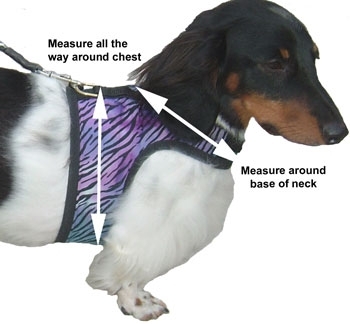 I love that you can send in your dog's measurements and they make a customized harness to fit them perfectly. I prefer the mesh kind since they are lightweight and easy to wash. My sister and mom also have ones for their dogs and they prefer the patterned fabrics. 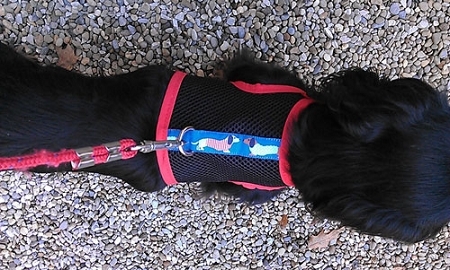 I would definitely recommend dachshund delights products And will always use Hug-a-dog Harnesses on my pups! Thanks DD! This is my second Hold-A-Dog Harness. It fits my Zoe perfectly. One thing I would change on this harness as compared to the other. The handle/seat belt strap is too long. It sticks up and looks a little funny. Other than that, the fit, style, color, design quality are all A+! 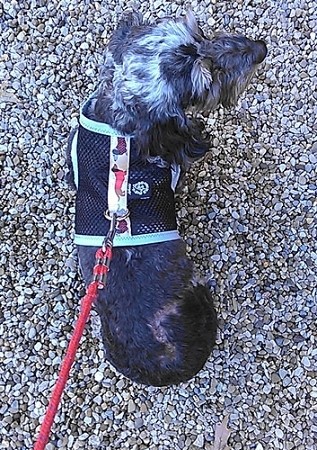 My sweet little Cocoa loves her new hold-a dog mesh harness and dealing with Dachshund Delights was a delight! Cocoa was sleeping when I took her measurements and when she woke up, in double checking the numbers, I found I needed to change them a little. I emailed customer service, they received my changes in time to correct my error. I was very thankful!!! This is our third hug and hold-a-dog harness. This time we got the mesh. I like the mesh for summer because it gets very hot here. I think Ginger likes it too. She looks very comfortable in it. I like the handle strap to grab her or put her in the car seatbelt. I have been a fan of your Hug-a-Dog harnesses for years. 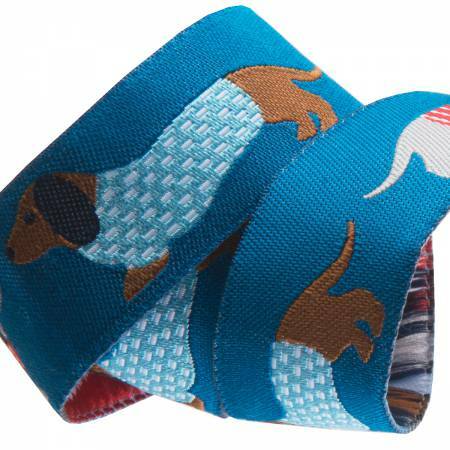 Your company never disappoints...the fit is always right, they're well made, fashionable & our doxie loves 'em. They are well worth the price. I tried another company selling similar products, and was profoundly disappointed in the fit & quality. I also had difficulty returning the merchandise. Keep up the good work! You guys ROCK!! Wonderful!! The measurements sent in allowed the harness to be personalized and fit my pup perfectly. The velcro straps are also long enough so you have liberty to adjust a couple of inches if needed. Also, the strap around the neck also has a plastic clasp to ensure safety if your pooch pulls too hard on the leash or tries to run. Love!!! ALSO - embroidery of phone # on the harness looks great and was SO worth it! Perfect safety measure. We just received our second Hold-a-Dog Harness. The first one was 7 years old. Zoey, our little 7 year old shorthair red Dachsie sweetheart looks very elegant in her new green trimmed black mesh harness. We love the handle which helps with picking her up and holding her in place at times. We give your harnesses a 5 star rating and recommend them highly. These truly are the best harnesses for doxies. I have 5 different harnesses at home. I kept trying to find one that my pups could wear. I have 2 mini doxies. Other harnesses would rub them raw under their legs and chest areas. My one pup is very lean and she could get out of all the other harnesses. I just got my hug a dog harnesses. They are well made, strong, and comfortable! No raw areas! Not even redness on their skin! The fit is great. I love that the mesh breathes. Best of all, my girls love putting them on. They don't run anymore when I get the harnesses out. 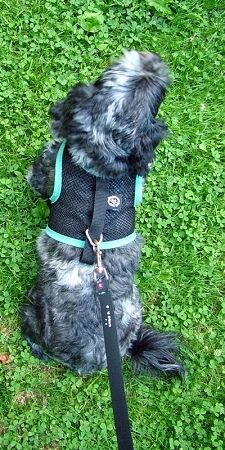 The black mesh Hold-A-Dog harness does what it advertizes. It is light weight and cool enough for our hot summer days. Winnie is very comfortable in it. I feel better knowing when she or I pull, her chest is taking on the force, not her neck.I feel as though I have more control of her because I can influence the front end of her body more easily. We have not tested her in the car using the seat belt through the harness loop. I like her embroidered name. It identifies her and who the harness belongs to in a quiet way. 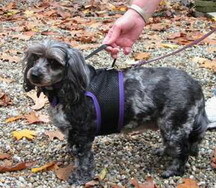 I have been using Hold A Dog Harnesses since learning of them after my Dachshund had her back surgery in 2009. We use them for both of our Dachsies and Cairn Terrier. We get compliments on the harnesses all of the time and the vet raves about them each time we visit. Love the harnesses and the dogs do not mind them! I have purchased 5 harnesses and they are lightweight and convenient -- plus the dogs have no problem leaving them on all day long. The patches are a fun addition and sewing in their name and phone number are very useful. And of course they do just as well on other breeds of dogs. They are bit expensive but, all in all, are well worth the extra money! The fit and hold is amazing. Makes Max's walks so much more comfortable. The handle is so handy in car and x-pen. Love the reflective tape for evening walks. Makes our camping trips much more enjoyable. I've purchased at least four of these harnesses for my dogs and I love them! The dogs do, too. When we go for walks, the dogs dive head first into their harnesses! They're comfortable, adjustable, attractive and safe. No more choking dogs! The harnesses last forever and wash up nicely. In my most recent order, I included the reflective strip and my embroidered phone number. Great features! The only improvement I could see is figuring out a way to keep dogs from sticking to carpet if they're wearing their harness and a bit of the Velcro is exposed. I just cover the exposed Velcro with a separate piece of Velcro but it would be neat to have a solution that's attached to the actual harness. Measuring instructions: 1) around "heaviest" part of chest; 2) around the base of the neck.